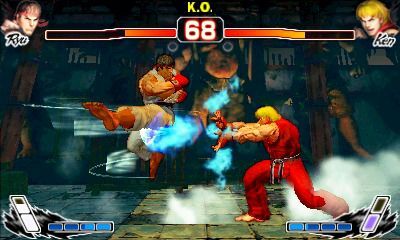 Given how far the 3DS has come, and how impressive its library has grown, it can be hard to remember that during the system’s first few months on the market, its sole highlight was a port of Super Street Fighter IV. It had to satisfy 3DS owners while they waited for Super Mario 3D Land and Pokemon. 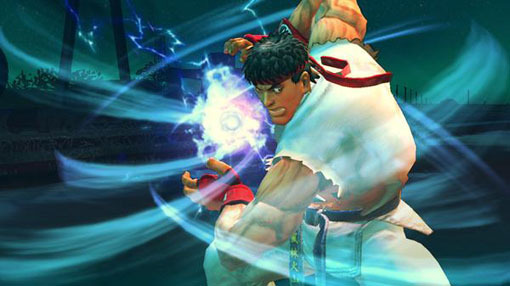 Thankfully, Super Street Fighter IV is a hefty enough game to have helped the 3DS in its bleak beginnings. Unfortunately, hindsight also shows that this 3D Edition is probably the title’s weakest iteration. The fighting mechanics don’t always translate well on the handheld. The joystick and button layout all work well enough, but pulling off some of the more advanced combos can be a little more difficult than they should be. The characters don’t move as fluidly with the control stick as they do in the game’s home console counterparts, which makes chaining together button presses and movements feel less responsive. Capcom seemed to address this by adding buttons on the touchscreen which perform characters’ special moves without the need to perform more extravagant combos. This comes as a bit of a double-edged sword, however. While the touch screen specials do make the game more accessible on the 3DS, they are also easily exploited, leaving many multiplayer matches to feel one-sided in favor of whoever hits the first move. Perhaps brief cool down times on the touch screen could have prevented this move-spamming. Visually, the game still holds up. 3D Edition looks nearly as impressive as its HD home console counterparts. Better still, the 3D effects, while among the first to hit the 3DS, are still impressive. The 3D is especially noticeable during the character’s more extravagant animations in their special moves. Super Street Fighter IV: 3D Edition is still a solid gameplay experience, but some of the game’s finer aspects were a little lost in the transition to its handheld form. You can still find a complex fighter if you dig deep enough, but some of the tweaks that attempt accessibility only end up making 3D Edition feel considerably more hollow than its refined home console editions.